After attending the Pioneers Festival, held on October 29-31 in Vienna, Skolkovo's companies is due to take part in the Slush festival, scheduled on November 21-22 in Helsinki. 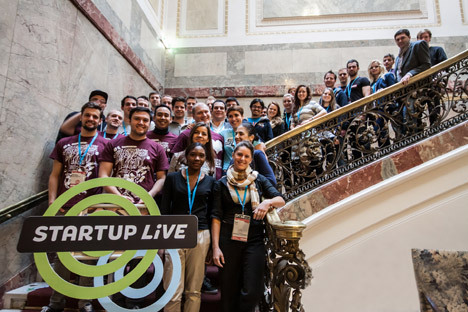 A series of start-up festivals for venture capitalists is currently taking place in Vienna and Helsinki in October and November. Skolkovo's companies is among the participants. His optimism is based on the lists of participants in the Vienna Pioneers and Helsinki Slush startup festivals. For example, IndoorGo, a company co-founded by the Urals Federal University and the Ariel University Center in Israel, has developed an indoor positioning service. Preliminary tests have shown that the algorithm makes it possible to position objects to within a few inches using just a smartphone and a wireless network. The system is intended for use in exchanging targeted information and gathering statistics on visitors to exhibitions, museums, supermarkets, shopping malls and other large indoor spaces. Company Toytemic also has something interesting to offer. “We have invented and implemented the concept of self-organizing sensor networks, where each element can be controlled remotely,” said the firm’s managing director, Yevgeny Smetanin. What Smetanin means by “more developed sectors” is games; it’s no coincidence that Toytemic’s main platform is called “Strategy on the Carpet.” In layman’s terms, this involves transferring computer strategies from virtual reality to real life. Toy soldiers with built-in chips can interact amongst themselves and carry out their owner’s orders. The commercial prospects for this invention are self-evident, according to Smetanin. The level of electric engineering in modern mass-produced toys is on a par with that of primitive robots. This means that Strategy on the Carpet could sell well, provided it establishes contacts with leading manufacturers. “That’s exactly what Skolkovo is all about,” said Viljakainen. “Take, for instance, Angry Birds – a project of a good friend of mine. Just think: If you were told five years ago that it was possible to make millions by coming up with a game where multi-colored birds hunt green pigs, you wouldn’t have believed it. That looked like nonsense back then. Now you can see that it is quite possible."